Posted on January 16th, 2013 in Events. No Comments. I am excited to be participating in a group exhibition of artwork created from cardboard in about a week and a half in Orlando, Florida. A large warehouse space will be filled with all sorts of whimsical cardboard art. Get the details at cardboardartfestival.com! 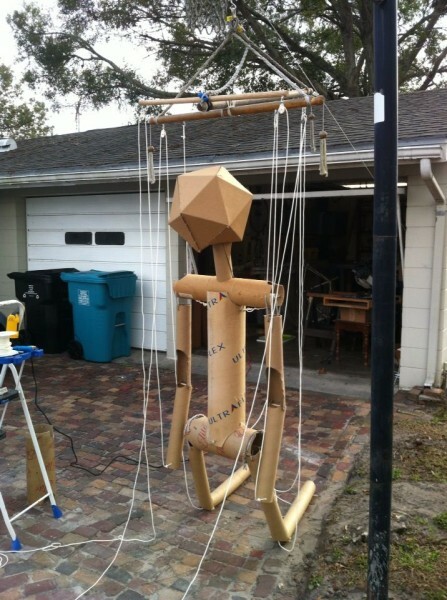 For my part, I have modified one of my larger-than-life stickpeople sculptures into a giant multiplayer marionette! It will take 4 to 6 people to fully operate. Here is a shot of me testing it and working on it in my driveway.